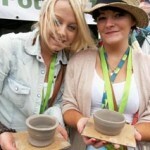 Here’s a small selection of some of the lovely photos taken at The Big Chill Festival 2011. By the end of tomorrow, we hope to have published separate facebook photo albums for all three days at the festival…..watch this space! It was a real pleasure working with you all. Those who selected the fired & posted option, your creations made it back to the studio and are drying nicely! Looking for something a little different, totaly relaxing and creative to do during the day at the Chill? 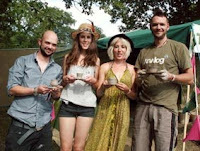 Jon ‘the potter’ from Eastnor Pottery & The Flying Potter will once again be offering festival goers the opportunity to make a pot on the potter’s wheel. Must say, as residents of Eastnor, we’ve been very impressed with the professional and smooth way in which the festival has been put together. Festival Republic have taken on the running of the Big Chill, bringing to the table years of experience and expertise of staging similar festivals all over the UK. We secured our passes and wristbands with the minimum of ‘fuss’ and by Wednesday evening we were pitched up in the Body & Soul area ready to receive our first festival potters. We intend to publish photos from the Deer Park on a daily basis (yer right!) so watch this space! Not long to go now! 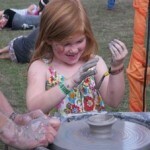 Come and see us in the body & soul area and sample the delights of throwing a pot on the wheel: Friday 6 – Sunday 8 August 2010. Here’s a couple of photos from last years festival.